REDONDO BEACH, Calif., Jan. 10, 2011 -- Highlighted by the completion of its most important milestone to date, Mission Critical Design Review, NASA's James Webb Space Telescope made significant progress throughout 2010. 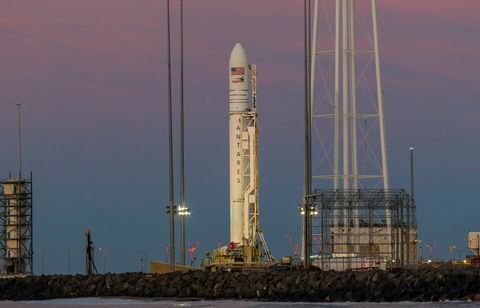 Northrop Grumman Corporation (NYSE:NOC) is leading the design and development effort for the space agency's Goddard Space Flight Center. In April, the telescope passed its Mission Critical Design Review, which signified that the integrated observatory will meet all science and engineering requirements for the mission. This review encompassed all previous design reviews and marked seven years of intense, focused effort on the part of NASA, Northrop Grumman and the Webb telescope team members. Webb's primary mirror segments made significant progress this year. An engineering development unit and the first flight segment were polished to their exact prescriptions and verified at operational cryogenic temperatures. After completing this milestone, these mirror segments, as well as the tertiary and fine steering mirrors, progressed to the last step in the mirror manufacturing process -- undergoing an ultra-thin coating of gold to increase reflective properties. The coated engineering development mirror segment recently passed its final cryogenic test, making it the first completely finished mirror segment to do so. It is being closely followed by the flight segments in the coating and verification process. Data from tests performed on a two-story facsimile of the telescope's core section was successfully correlated to within 10 to 15 percent of cryogenic heat flow. Engineers understand the heat flow in the core region to a handful of milliwatts, representing major progress in validating and optimizing the telescope's thermal performance. Production of the flight backplane, which supports the mirror segments and all of the telescope subsystems, continued to make steady progress throughout the year.Â Assembly of the Pathfinder backplane was completed, with delivery expected in early 2011. Webb teammate ITT verified placement accuracies for robotic mirror installation equipment that installs the mirror segments onto the backplane. The segments' position will be fine-tuned to tolerances of a fraction of the width of a human hair. Mirror control electronics for the first flight mirror were also completed. A series of successful tests continued to mark the sunshield's progress. Webb engineers completed testing of a one-third scale model in a thermal vacuum chamber which simulated the cold background temperature of space and the heat generated by the sun. The test proved the sunshield design can block and redirect the sun's energy before it reaches the telescope and also verified the accuracy of computer thermal models used to predict how the full-size sunshield will perform. In another series of successful trials, sunshield test articles underwent launch depressurization simulations to verify how the intricately folded sunshield membranes will perform under a rapid loss of pressure during launch. The tests showed the membranes stayed in their stowed shape and allowed trapped air to escape safely, both critical to sunshield deployment and performance. Sunshield template layer manufacturing is also underway, the first step to creating the flight sunshield. Progress was made on the deployment tower assembly, which is a 9.6 foot telescoping tower that supports the primary mirror and science instruments. The deployment tower test article, the outer cylinder of a composite structure, was successfully tooled and bonded. In addition, engineering model testing was completed for the spacecraft's Command and Data Handling system, the electronic brain that sends science data to the ground station.